The 2019 session has convened. As of January 20th no NPV bill has been introduced. Check back for updates as the session progresses. On January 19, 2018 HB0193 was introduced in the Utah House of Representatives. This from the NPV supporters in Utah: Save the date and stay tuned: NPV UTAH has signed up in solidarity with New Mexico and will be planning a National Popular Vote Day event on Saturday 10/7/17. 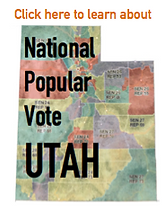 Join this national movement, have a great time while creating awareness and support for the National Popular Vote Interstate Compact in preparation for Utah's 2018 legislative session. State Chapter of PRO NPVC movement..
On February 10, 2012, Utah state Senator Howard Stephenson introduced the National Popular Vote bill (SB-63) in the Utah Senate, and Representative Kraig Powell introduced the bill (HB 509) in the House of Representatives. On February 24, 2011, Senator Stephen H. Urquhart introduced the National Popular Vote bill [SB 252] in the Utah Senate. On February 2, 2011, Representative Neil A. Hansen introduced the National Popular Vote bill (HB 297) for the 2010 legislative session. On January 27, 2007, Utah State Representative Neil A. Hansen introduced the National Popular Vote bill (HB 346) (Status of HB 346) into Utah Legislature for the 2007 session.